Darrell was wonderful to work with. he was a great listener to our vision and then came thru on completing the setting that we had imagined. Absolutely perfect and so so beautiful! Darrell was perfect! I was recommended to him by a mutual friend and I have absolutely no regrets. He made my day look so beautiful, I actually cried when I got to the venue and saw how beautiful everything was. When we first met Darrell, he asked what kind of budget we were working with and even though it was low, he stayed within budget and chose things that went together and looked perfect. I highly recommend giving him a call, he is the sweetest thing ever too! Thank you again Darrell! I met with Darrell Ward today and I am so impressed. He is professional, punctional, and a true artist, with lots of great ideas. He is 5 star and beyond! I am so thankful he was recommended to me. So excited to work with you ! We have a great future. Please always post your work on my account. When our daughter got married 10 years ago – Darrell Ward was highly recommended by my wife’s co-worker –in fact the co-worker insisted we hire him. It was definitely one of the best wedding decisions we made. Darrell was so much fun and his work was very creative and top notch. When our son got engaged 10 years later --- we called Darrell immediately to identity his availability before we decided on the date, venue and every other vendor. Darrell was our first decision. THAT is how important he was to us and the success of our son’s wedding. Darrell and his team make you feel like yours is the only event on the planet. From the first time you meet him – you will see why he is in such demand and does virtually no marketing. He doesn’t have to. When Darrell says he is “so excited!” for your wedding he means it. He is extremely creative and is always respectful of your budget. 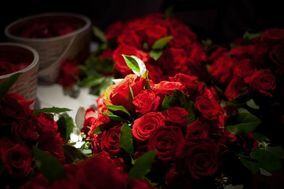 His goal is to not just provide you with beautiful flowers – but provide you with an exceptional experience. Our son’s wedding was a huge success – due largely to Darrell’s cheerful, enthusiastic attitude, customer service, attention to detail and beautiful flowers. 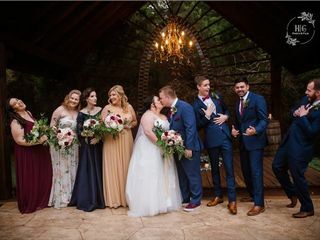 The entire wedding party wants to hire him for their weddings and guest after guest commented on his exceptional work and how much fun he was to interact with. Wedding planning can be stressful and overwhelming. Hire Darrell --- and your experience and the end result will exceed your expectations. Totally overwhelmed with your comments! Thank you so much. You know how special your family is! We hired Darrell for our daughter's wedding 10 years ago --- and the experience was so phenomenal that he was a MUST when our son got engaged. In fact Darrell's availability determined the wedding date. We simply would not have moved forward with out him. Once we secured Darrell-- we decided on the venue and every other detail. Weddings are often full of negotiations and compromises - but Darrell was a MUST HAVE! Darrell and his team embody every vendor characteristic noted above in spades - the problem with this scoring scale is there aren't enough stars. When you meet Darrell and hire him he will say that he is "so excited" and he could not be more sincere. He and his team are beyond creative, budget sensitive and go the extra mile to exceed your expectations. If you just want flowers --- then hire someone else. If you want a compassionate, creative, client centric professional then trust this review and hire Darrell!! It will be one of the best decision you will make! Loved working and our long time friendship. I'm so blessed to have you all. Darrell is wonderful to work with! He is responsive, very professional, makes beautiful arrangements and on top of it all, is very fun to work with. Reasonable pricing for beautiful work. I LOVE working with you All! Darrell was the perfect florist for us! He was so responsive and helpful. He responded to every message and listened to what I wanted and exceeded our expectations. Our guests could not stop talking about the flowers! You will not regret choosing Darrell! He makes you feel like you are the only bride even when he has 5 other weddings that week! It was such a pleasure to work with you. Darrell did a fantastic job and the flowers were beautiful for our wedding day. Everything was as we hoped and more. Thank you Darrell! Darrell is AMAZING! He is wonderful to work with and an expert in what he does. I have worked with him twice since 2009 and I wouldn't hesitate to work with him again or refer him. He truly knows his craft and he is a class act! He responds immediately when you need ANYTHING. Darrell always exceeds my expectations. He really is the best DFW has to offer. I will use Darrell for anything I need arrangements for going forward. I can't imagine using a company after meeting him. He gave me such a personalized experience and made my vision come to life, better than I could have ever imagined! He is such a gem and I was beyond lucky to have him do our February wedding. Darrell is THE BEST! I had no clue what kind of flowers I wanted for my wedding when we started, but he walked me through the whole process and made it so easy! He was flexible when we changed our minds on a few things and he rolled with some timeline changes so smoothly! 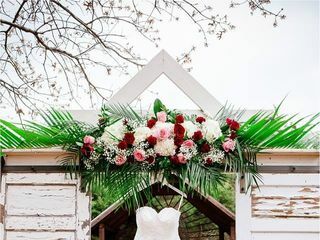 The flowers were the talk of the reception! He did an amazing job! It was such a pleasure to work with both you and your mother. Wow, where can I even begin to tell you how AMAZING Darrell and his team are?!! I provided him with pictures of some of the flowers I wanted so he could get an idea of the vision in my head. WHOAH, he created exactly what I had in my mind, but BETTER! He is so sweet, goes the extra mile, is flexible and just AMAZING!! I have worked with Darrell and he is just the best! Dama is the best of the best. Darrell has to be the BEST florist in the city! He did the flowers for both of my daughter's weddings - one three years ago and one last month. 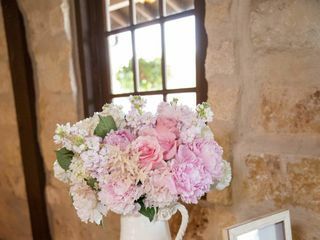 People STILL talk about the beautiful flowers from the first wedding!! And I'm sure they will with the most recent wedding too. Darrell loves flowers, has a great eye, and puts together exactly what a bride pictures in her mind. He has many flowers to choose from, goes out of the way to make perfectly gorgeous bouquets, arrangements, and displays, and his prices are so very reasonable. I can't recommend him high enough - I'd give him 10 stars if I could! You could not find a more fun, honest, and likable florist! Wish you had more daughters. All my love to you and Steve. Wow!!!! That's the best word to describe Darrell! He was incredible and my daughter's flowers were just beautiful....from the bouquets to the reception flowers! He understood exactly what we wanted and I actually cried when I walked into the reception room. It was even more beautiful than I expected. Darrell was also our "Day Of" Coordinator. He helped so much with our stress level and just took care of so much we would have had to deal with otherwise. My only regret is that we didn't use him from the very beginning of the whole wedding process. He's not only amazing as a florist, but a great coordinator! He will become one of your favorite people. He is a true gem!! I love your family and friends. It is so wonderful to work with someone like Darrell who loves what they do. Great attention to detail. Looking forward to working with him again on the next daughter's wedding. Darrell was very perceptive in helping my daughter-in-law choose flowers for all of her arrangements and bouquets for her wedding. He seemed to be able to 'read her mind' and know exactly what she wanted. He was very easy to work with and through emails, we were able to let him know minor changes and he accommodated us. 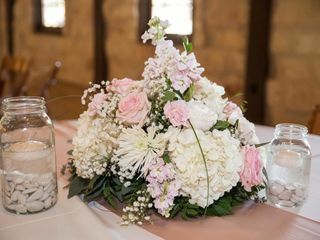 We got raving reviews from the wedding guests on how beautiful the flowers were! Thank you so much Darrell! The flowers Darrell did for my daughter wedding were amazing! He created exactly what I saw in my head. I live out of town and met Darrell at the Chapel before the wedding. I felt like we had known each other forever with his easy going style and friendliness! excellent job. You were a blast to work with. Before you book your wedding date, you need to find out of Darrell is available! He supplied the flowers for both of our daughters' weddings and both were fabulous. He not only does beautiful flowers, ceremony and reception decorations, but he is extremely valuable as your day-of coordinator. You need him for this - trust me. He was our ally and friend throughout the wedding planning process. You will not find anyone any better. So LOVED working with you! We hired Darrell for our daughter and son-in-law's wedding on May 21, 2017. I cannot begin to explain what a joy it has been to work you, Darrell! From the first meeting (while he was on vacation... he met with us) because we were coming from 5 hours away and it was the only time we had available, to just being very easy to reach with just a phone call away. He makes everything easy, really does want to make the bride happy, and takes pride in his work. You do amazing work!! 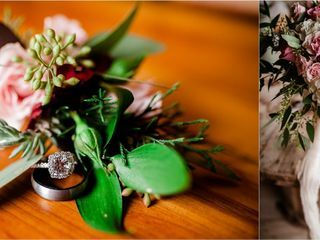 Stephanie and John's wedding flowers were stunning! We were told by many of the attendees just how beautiful the arrangements and bouquets were. We couldn't have been happier and neither could Stephanie and John! You truly are a blessing to anyone planning a wedding or an event!! My husband said,"if we had another kid and had to do this again, we would definitely know who to hire!" ;o) You, my friend, have everything a professional should have in this industry: professionalism, courtesy, friendliness, pride, helpfulness, and beautiful arrangements that you produce. Stephanie could not have found a better florist! You are not only vendor, but now a friend! Thank you for helping to make Stephanie and John's special day, "Magnificent!" If you are looking for a reliable florist that will be with you every step of the way and exceed every expectation....Darrell is your Florist! From the bottom of our hearts...thank you! Darrell is the best! He truly went above and beyond to make our wedding perfect. He worked as our florist, as well as day-of coordinator, and he excelled at both. He listened to exactly what we wanted in terms of flowers and made our vision a reality. The venue started as a fairly blank slate, and the flowers brought so much color and beauty to the space. He also made an incredible arch, which was the perfect backdrop to our ceremony. He even went the extra mile to make sure it was stable during the windy weather that day. 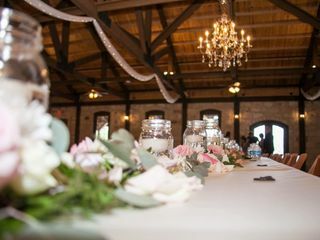 As our coordinator, Darrell handled so many things to ensure that the wedding day ran smoothly. From contacting vendors to setting aside food for my husband and me, Darrell was there to help us remain as stress-free as possible. He even assisted with a last-minute wedding dress bustle snafu, which was so appreciated! Darrell was truly a joy to work with, and I would highly recommend him to anyone looking for a florist and/or coordinator. Darrell did an outstanding job with our daughters wedding. The flower arangements were beautiful, the altar arch was breathtaking and all the bouquets were fabulous. Darrell did a wonderful job handling all the details and making sure the bride was happy. You can certainly tell that Darrell loves his job! 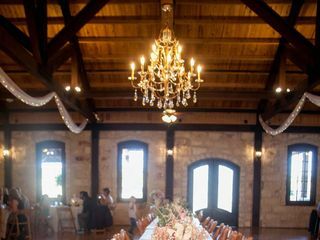 He is easy to work with and will work with the budget to make sure the venue looks spectacular. This was our second experience with Darrell and both times he went over and beyond to make sure the wedding was one of the brides dreams. Darrell is the BEST! HERO OF THE DAY best describes Darrel's performance for my daughter's wedding. Enthusiastic, easy to work with, determined to please all describe the individualized attention he gives his brides. His stunning arrangements transformed both the ceremony and the reception venues into breathtaking scenes. Our guests described his handiwork as "over the top". The venue said that it was one of the prettiest set-ups they have seen done. He exceeds the expectation, going above and beyond everything we could ask or even think. He doesn't stop until every last detail is perfect. He's THE BEST. Darrell is a LIFESAVER!! I had a last minute event for 300 ppl, and he came to my rescue with table centerpieces! I recommend him to everyone! beautiful arrangements and very well priced.